Custom bar signs as well as other types of personalized metal signs can now be purchased through our online store! We offer a wide variety of personalized home bar signs, pub, military, quick ship and vacation home decorative signs in vintage and modern styles. Our Personalized bar signs are made of metal and can be hung easily using small holes in each of the corners. 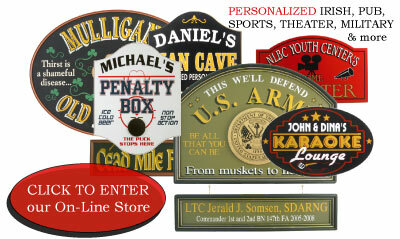 Our signs make a great, personalized gift at a price that is surprisingly inexpensive. Great house warming, home bar, or seasonal gifts for just about anybody! restrooms, storage closets and more! Get one of our vintage style pub signs today!